With its ultra-thin design and single-use functionality, users might think that a teardown of Apple's new Magic Trackpad would be straightforward and uninteresting. But the experts at iFixit show us in one of their famous teardowns how Apple pulls off the design and puts it all together into a sleek package. As is becoming increasingly common for Apple's device, particularly its peripherals, disassembly is not for the faint of heart, with a fair amount of prying required and some adhesive to fight through in order to fully access the internals. 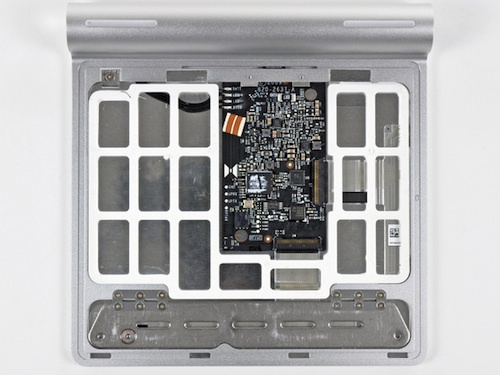 Once inside, iFixit discovered a small logic board roughly in the center of the device carrying the same Broadcom Bluetooth chip used in the Magic Mouse and the same Broadcom touch controller found in the iPhone, iPod touch, and MacBook Air, in addition to 256 KB of flash memory. The remainder of the interior surrounding the logic board contains a white plastic spacer designed to prevent damage to the logic board should the device be squeezed. One of the other interesting design features we previously noted is the Apple's use of the Magic Trackpad's feet to generate the "click" when the user presses down on the device's surface. 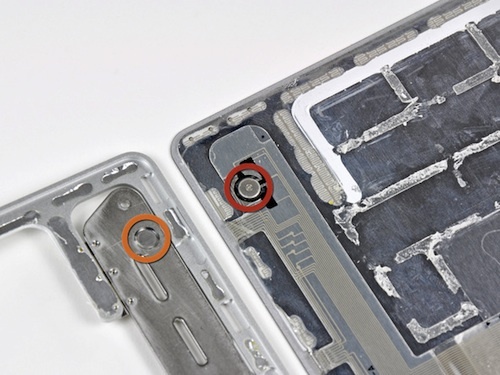 iFixit's teardown reveals how depressing the surface of the trackpad causes the feet to push up onto a hinged metal plate that runs along the front edge of the device inside the chassis. That metal plate then contacts a small mouse button to activate the clicking functionality.